This easy curry dish is like a vegan palak paneer, with chickpeas instead of paneer and kale instead of spinach. It’s a delicious and quick meal for two. There’s nothing like being left alone for the weekend to make someone who “loves to cook” lose all desire to operate a stove. My husband and daughter ran off to New Orleans this past weekend, and though you’d think I would seize the opportunity to cook dishes that I like that they don’t, the ugly reality is that my diet deteriorated into sandwiches and reheated leftovers. Cooking without someone to cook for just isn’t my thing; besides, with my clean-up crew away on vacation, I knew that anything I cooked I’d also have to clean up. But after a couple of days of sandwiches, I was ready for real food again, as long as I didn’t have to work too hard for it. 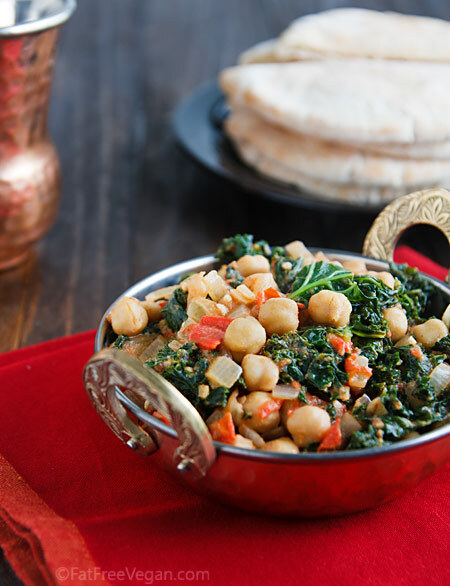 And so I took a half-bunch of kale that needed to be used, combined it with a fresh tomato and a cup of chickpeas, and came up with this relative of palak paneer, with kale instead of the spinach and chickpeas standing in for the cheese. Since I was all alone, I made only a little, enough for one or two servings, and because I didn’t have any rice cooked, I packed it into toasted pita bread. I added seasonings to taste and had absolutely no intention of sharing the recipe–until I tasted it. It was so good that I quickly spooned it into a fancy bowl I’d bought at the local Indian restaurant and snapped a couple of photos before devouring it. It’s super-easy and a great meal if you’re cooking for one or two, though feel free to double or triple it if you’re lucky enough to be cooking for a crowd. Tahini is not a traditional ingredient in Indian dishes, but here it adds a richness normally provided by cream. If you’re avoiding all added fat, you can leave it out. Heat a medium-sized non-stick pot over medium-high heat. Add the onions and cook, stirring often, until they soften and begin to brown. (I do this without any liquid, but if they start to stick, add a tablespoon of water or broth.) Add the ginger, garlic, and cumin seeds, and cook for another minute or two, until the cumin becomes fragrant. Add the tomato and cook for two more minutes. Stir in the kale and 1/4 cup broth and cover tightly. Cook, stirring occasionally, until the kale is tender but still bright green, about 3-5 minutes. Add the chickpeas, remaining 1/4 cup broth, and all seasonings except garam masala. Cover and cook on low for about 10 minutes. Stir in the garam masala and tahini and add salt to taste and cook for another minute or two. Serve over whole grain, with bread, or stuffed into pitas. You can use spinach or another green instead of kale, but measure it by weight, not cups. If you would like a smoother texture, process the kale/tomato/onion mixture briefly in the food processor after step 2. Return it to the pan before adding the chickpeas and continuing the recipe. Mmm… this looks so good! I am the same… I don’t think I would cook if I didn’t have anyone to cook for! The fun part is serving your “creation” to someone and watching them enjoy it! That looks so delicious! i love the wonderful flavor of a good curry! Thanks for sharing! Thank you so much. How did you now that we just received dinosaur kale in our new-to-us farm share box! I’m so excited to use it right away! I love kale and I low new-to-me uses for it. Thank you again! Now that I am on a more strict diet, I find that I religiously attend to your blog as often as I can. You are fabulous! Just a note. The website is called “fat-free vegan”. The 2 tablespoons of tahini makes the dish “fat vegan” given there are about 120 calories per tablespoon of oil in general so adds an extra 240 calories. Also, the title says “curried” but I don’t see curry in the ingredients list. Any substitute for the tahini for McDougallers like myself to avoid the oil and extra calories? You can leave the tahini out. The website is called “fat-free,” but as I explain on the “about” page, small amounts of nuts and seeds are allowed. Recipes that have more than 15% calories from fat, such as this one, are marked as “higher fat.” But note that it calls for two teaspoons of tahini, not two tablespoons. If you leave them out, you will save 30 calories and 2.7 grams of fat. Curry is a generic term for a type of dish with Indian or Thai seasonings. Authentic curries don’t use curry powder but a blend of spices such as cumin, cardamom, coriander, cinnamon, and ginger. Some curries, but not the majority, use leaves from the curry plant, which are difficult to find in many places in the US. I’m sorry, but this comment sounded quite rude to me. If you don’t like something about the recipe, change it or don’t make it, but there’s no need to take the tone you did. Wow. That comment almost made me want to bust in here and become a white knighter of Susan’s! I have to restrain myself. You are both reading it wrong. I don’t think he was being rude, just asking for clarification. He was asking for information and the blogger was great to answer. Blogging is about communication, and I like to think that this is just misreading the intent of the person questioning when accusations of rude are bandied. I appreciate the clarification. Thanks to both of you. I just visited this site and will be back. This looks great! I will definitely try it with a melange of garden greens. I like the addition of a small amount of tahini, though it’s not traditional. I can see how that adds a nice touch. Love the actual dish too! You made me laugh about having to cook AND clean up!! Welcome to my kitchen–LOL! Which is why I am often lazy girl or simple yet whole is best. Thanks for another great recipe–and I bet that tomato was from your garden? This recipe looks simple and delicious. You know, I forget about using kale sometimes and always jump to using spinach. Thanks for reminding me how easy and tasty kale can be. I will definitely be trying out this recipe. Very healthy! i just made this for lunch with leftover chickpeas and used turnip greens and the unstoppable swiss chard from my garden. it was simple, easy to prepare and suprisingly delicious! and yes, few dishes were dirtied in the making of this meal. on an unrelated note, i have an over-abundance of purple basil! any recos? Another great looking kale recipe! I’m going to make this tonight. i love kale. i eat it almost every day. never thought to use chickpeas. Made this for dinner tonight as I had all the ingredients on hand. Combined it with whole grain short brown rice and wrapped it all together in a whole grain tortilla wrap. This was fabulous! Will definitely make again! Thank you, Susan! I am going to make this soon. Thanks! Made this last night for dinner. So easy and the older kids loved it too! Thanks for keeping us inspired Susan! Made this last night for dinner. It was a hit! 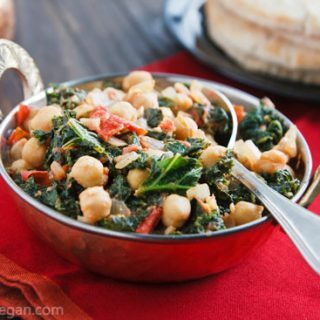 Chickpeas are favourite in my household and I’ve been trying to use more kale so this recipe was just what I needed. I know I’m going to love this dish. I can’t wait to try the recipe as written after using it as a springboard for my breakfast dish this morning. I didn’t have any chickpeas. How could I run out of my favorite bean?! Also had limited kale but trying to use up some volunteer turnip greens. No fresh tomatoes yet, but I DO have tomatoes dried during last year’s bounty. And lastly, had some pre-cooked steal-cut oats. I can always count on your recipes being delicious. Thanks, Susan! This looks delicious and filling but totally simple. Another great, timely recipe as kale is so abundant this time of year. Also, love the silver serving dish you used! This recipe looks so healthy and fresh! I am actually hosting a kale linky party at http://www.2sisters2cities.com/2012/06/kale_recipes/ as part of our Fresh Produce Tuesday series. I would love if you submitted this recipe! Hubby & I have been vegan since 8/2011, he’s retired and I work from home. We are in the midst of changing roles, me the breadwinner, him the bread maker (so to speak). He always made the meat part of the meal on the bbq, I did all other sides and deserts in the kitchen. He is now chief cook and bottle washer and not so much the griller anymore. I suggested this recipe to him and off he went, even with some measurement problems this recipe came out extremely well. The blend of spices was just a titillating treat to the nose and tongue. We served it in a pita, it was more than enough for two (thankfully there is a bit left to share). It made enough to fill 2 whole pitas (sliced in half) – we could only finish 1-1/2. For stuffing into a pita there was quite a bit of liquid (tasty stuff though) and the bread got a little soggy (even though I used a slotted spoon), but didn’t slow me down a bit 🙂 I would suggest using less broth or reducing the liquid over heat for sandwiches. Left over chickpeas – no fry falafal may be next. Cook on Susan! I love your recipes. made this tonight. I will say I thought the cardamon overwhelmed it. next time i will either omit it or cut it in half. really easy recipe though. I’m going to try this, I think I’ll sub tofu for the chickpeas. I’m still eating your balsamic raisin dressing and vulcan fire salt almost every day. Tonight a salad with greens from the garden, carrot, green garlic, barley and some lime ginger dal, all mixed together, may not sound good, but it is! Sure, here you go, http://tastespace.wordpress.com/2011/09/26/split-pea-dal-with-ginger-and-lime/. I change some things, cooked in pressure cooker, add more water because I like it less thick, also added a serrano chili. Anyway it is delicious, I made a different dal today and was dissapointed, so tomorrow will make another batch of the dal with ginger and lime. I like the flavor of tahini but find it difficult to use. We made this recipe tonight and liked it a lot–great combination of spices. I didn’t have any cooked chickpeas, so I used pinto beans, which were good, but I imagine chickpeas would be better. My question is: how do you store your tahini, and if, like me, you store it in the refrigerator, how do you get it smooth for incorporating into the dish? I store the tahini chilled to keep it from going rancid, but maybe that is not necessary. I used to store at room temp, but the oil always separated from the pureed sesame seeds (just as it does in the refrigerator), compacting the solids and making them impossible to homogenize with the oil, not to mention incorporate into other ingredients. Even though this recipe calls for only two teaspoons, that small amount remained lumpy in cooking and had to be smushed on the plate before eating. I didn’t see any comments from people with the same problem, so maybe someone can tell me a better way. Then maybe I’d try more tahini recipes! I sort of smush it into the skillet while cooking, and that, combined with the heat, allows it to blend into the dish. It’s always a little hard when I get near the bottom of a jar, but I just work it in more. You can also put it into the blender with some hot liquid and blend it before adding it to most dishes. I’m a big fan of Kale and this both sounds and look delicious, will definitely try this. Thank you! This recipe is terrific. My whole family and one non-vegan, non-vegetable eater loved it. It was especially good cold the next day. Susan, your recipes make my life easier. Thanks! I feel the same way! My husband was visiting family for 2 weeks and I really didn’t want to cook much since it was no fun just making it all for myself. So i mostly had some reheated leftovers, some sandwiches and whatever else was lying around. I forced myself a few times to make some curries and just freeze them for when he got home, cuz I knew I wouldn’t eat it all. I usually make double batches of everything so it’s enough for 8 people as he eats a lot (when it’s fat free) and he likes to have leftovers for lunch. He came home tonight so i made a fresh tadka dal curry for dinner and he loved it. It was nice to be appreciated for cooking again! This is Delicious! Thank you for so many recipes with kale. That looks fantastic! I’ve never been a huge fan of chickpeas, but I’m beginning to warm to them, especially when they’re combined with tomato. Kale is one of my favorite greens — I’m not a huge spinach person (over-exposure to the slimy frozen stuff as a child), so this is a great direction to take Palak for me! 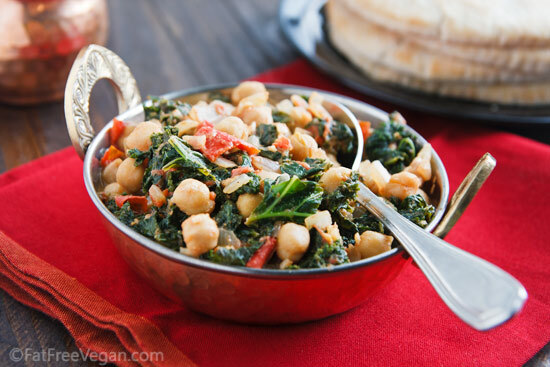 I’ve never thought of adding kale to chickpea curry before but it’s really a great idea. Have you also tried adding chaat masala for this recipe? okay. I just sent the take me off list again. I have clicked it many many times. maybe I have duplicate memberships? I dont know but PLEASE get me off all lists! I am very unhappy about this. I do not want these emails. It is causing lots of trouble for us.. This recipe was so delicious, made it for dinner. i used peanut butter for the nut, was really very tasty. thanks! I am happy, I found your site. I have printed up a few recipes and I am looking forward to making them. I must come back and browse although, I am sure it will be more than browsing. I am looking for more delicious recipes. I tried this recipe this evening and it was a big hit! We had it spooned over whole wheat pasta, it was a tasty combination indeed. We like spicy food, the red pepper and cumin was a nice touch with the chickpeas. This recipe is a keeper for sure! As for the tahini comment I’m right there with Carie and Wendy! I love it when you do such simple and delicious recipes like this. Thank you so much and hope you post many more! This is delicious. Like you, I was making it for myself, but doubled the recipe just in case it was good, and am glad I did for leftovers. It would be great over quinou (sp), but fine as is. I used peanut butter because that is what we had. are all your recipes ETL suitible? Most of them are. The ones that are most suitable are tagged Eat to Live, and you can find them here: https://blog.fatfreevegan.com/tag/eat-to-live. This is a very interesting dish. I’m going to try it at least once to see if my family will eat it. Thanks for sharing! Just made this recipe tonight and our bellies are super happy! I’ve been looking for more easy Indian inspired dishes to spice up our mealtimes. This one is definitely going to be a regular on the rota. Thanks! As my first vegan venture, I made the curried chick peas and kale. I substituted Swiss chard since it looked so beautiful. I also doubled the spices because I like a bold flavor. With brown rice, this was a satisfying meal and fairly simple to prepare. I am encouraged to try more of the recipes on this site! I just made this for lunch and am currently eating it. I’m in food heaven! I added a little extra red pepper flakes for more heat, MMMMMmmmmm. My hats off to you for this amazing meal. Thank you! I love this dish! Thank-you so much for sharing! Been looking at a lot of youe recipes and this one is probablt my favorite. I work in a heathfood store in NJ and been making a whole lot of kale dishes. This recipe gives me some good ideas. Thanks! Thank you for this – made it tonight for the family and it was delicious. Three small additions – some fresh lemon juice, sugar and freshly chopped coriander. A real keeper – and that’s high praise indeed from my kids. This is positively delicious! I doubled it (had the kale). Thank you Susan!